Usage–based billing refers to the methods of calculating and passing back the costs of running a network to the consumers of data that occur through the network. Both Internet Service Providers (ISP) and Corporations have a need for Usage-based billing with different billing models. NetFlow is the ideal technology for usage-based billing because it allows for the capture of all transactional information pertaining to the usage and some smart NetFlow technologies already exist to assist in the counting, allocation and substantiation of data usage. Advances in telecommunication technology have enabled ISPs to offer more convenient, streamlined billing options to customers based on bandwidth usage. One billing model used most commonly by ISPs in the USA is known as 95th percentile. The ISP filters the samples and disregards the highest 5% in order to establish the bill amount. This is an advantage to data consumers who have bursts of traffic because they’re not financially penalized for exceeding a traffic threshold for brief periods of time. The solution measures traffic employing a five-minute granularity standard typically over the course of a month. The disadvantage of 95th percentile model is that its not sustainable business model as data continues to become a utility like electricity. A second approach is a utility-based metered billing model that involves retaining a tally of all bytes consumed by a customer with some knowledge of data path to allow for premium or free traffic plans. Metered Internet usage is used in countries like Australia and most recently Canada who have nationally moved away from a 95th percentile model. This approach is also very popular in corporations whose business units share common network infrastructure and who are unwilling to accept “per user” cost, but rather a real consumption based cost. For corporations usage-based billing enables the IT department to become a shared service and viewed as a profit center rather than a cost center. It can become viewed as something that’s a benefit and a catalyst for business growth rather than a necessary but expensive line item in the budget. For ISPs in the USA there is no doubt that a utility-based costs per byte model will continually be contentious as video and TV over the Internet usage increases. In other regions new business models that include packaging of video over “free zones” services have become popular meaning that the cost of premium content provision has fallen onto the content provider making utility billing viable in the USA. 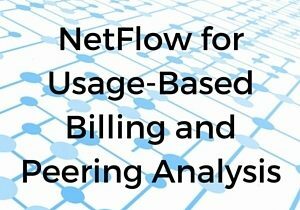 NetFlow tools can include methods for building billing reports and offer variety of usage-based billing model calculations. Some NetFlow tools even include an API to allow the chart-of-accounts to be retained and driven from traditional accounting systems using the NetFlow system to focus on the tallying. Grouping algorithms should be flexible within the solution to allow for grouping of all different variables such as interfaces, applications, Quality of Service (QoS), MAC Addresses, MPLS and IP groups. For ISPs and large corporations Asynchronous Network Numbers (ASN) also allow for analysis of data-paths allowing sensible negotiations with Peering partners and Content partners.